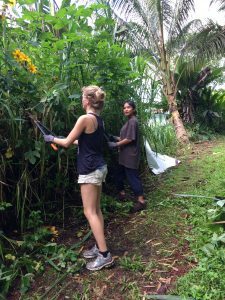 Hedonisia Hawaii is a community of Interns, Volunteers, and Ecotourist Guests. We are NOT a traditional tourist establishment so our community policies are a little different! The Community Support Day has been a great success with overwhelmingly positive Feedback! Before, visitors often felt like ordinary ‘hotel’ guests. This created a little disconnect from the rest of the community, especially during volunteer work hours. Now, Guests are part of the community with one work shift per week. Many Eco-tourists actually want to do something useful while on holiday. Having one work shift a week gives them a great way to contribute to the community and yet have lots of time to enjoy the island. Thursday is the default Community Support Shift Day for Weekly or Monthly Guests. However, we can still make custom arrangements for guests who have special deals when it comes to their support shifts. A volunteer work shift usually consists of cleaning or weeding. We are also open to work suggestions! For example, someone who is a carpenter might suggest a carpentry project for their community support day. Guests who pay nightly rates are not required to do a community support day. However, they are welcome to pitch in on a project if they so desire! Community Support Shifts are on Thursday starting at 9:30am and are 3 hours long. Depending on the size of the crowd this tour can be 1/2 to one hour in length. And it’s free! Some Guests may not want to work at all during the time they are here and we understand that! After all, we live in paradise! A Community Support Day is valued at $20 per person. So if you don’t want to work you can simply pay the fee and then you can completely relax into the soothing lush jungle of Hedonisia!